On the last Sunday of November, Republicans had a lot of airtime — and lots of lies. On Meet the Press, anti-tax advocate Grover Norquist of Americans for Tax Reform regurgitated the false Republican talking point that Obama's stimulus plan "killed jobs." Freshman Senator Pat Toomey (R-PA) made an appearance on This Week to claim the deficit is not a revenue problem, a statement disputed by historically low revenue intake. Sen. Jon Kyl (R-AZ) appeared on Fox News Sunday to hype the "Toomey Plan", claiming that it would have raised revenues while paying down the debt, leaving out that the plan trades regressive tax cuts for only small revenue increases. Lastly, Herman Cain appeared on State of the Union to claim that unemployment benefits shouldn't be extended because they are a 'distraction' from the real problem of a lack of economic growth. But the Congressional Budget Office has found that unemployment benefits are a "timely and cost-effective" way to spur on the economy. 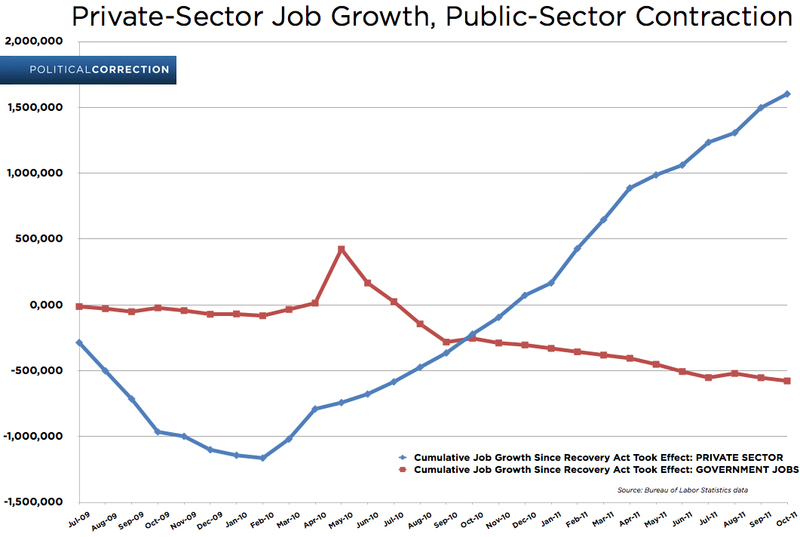 GROVER NORQUIST: We just wasted $800 billion on stimulus spending that added to debt that killed jobs. There are fewer jobs than before. CLAIM: Sen. Toomey Claimed "The Problem That's Creating This Deficit Is Not A Revenue Problem"
SEN. PAT TOOMEY: First of all, let's be clear, the problem that's creating this deficit is not a revenue problem. With this very current tax code that we have now, with all its flaws but with current rates, as recently as 2007, we had a budget that was virtually balanced. Sure enough, the historical White House budget tables show that receipts (ie, taxes) in 2011 are estimated to be just 14.4 percent of GDP — the lowest level since 1950. But outlays (ie, spending) in 2011 are estimated to be 25.3 percent of GDP — the highest level since World War II. That yawning gap is the key reason why the deficit is so large-and why Republican claims that there is "no revenue problem" are worthy of a couple of Pinocchios. 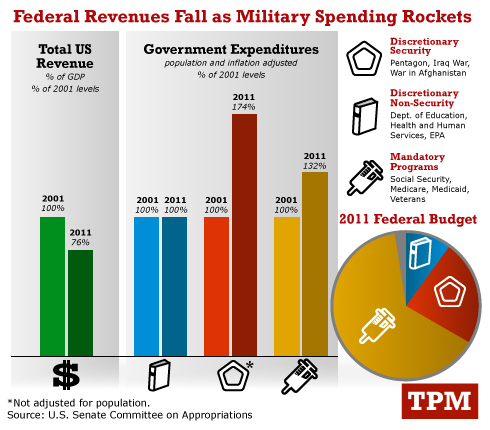 We took the numbers and put them in a slightly different context, so you can see by what percentage spending and revenues have risen and fallen on a population adjusted basis over the last decade. 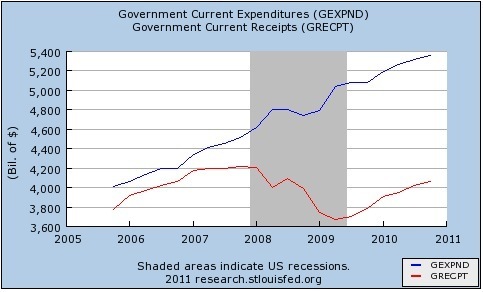 Makes it pretty clear what is and is not the culprit of deficits and our supposedly out-of-control spending. SEN. JON KYL: And the proof in the pudding is the fact that the so-called Toomey Plan, which Republicans, all six of us, offered to the Democrats, would specifically have raised tax revenues. It would have raised $250 billion more than the tax reform that would be necessary to reduce the rates and would have applied that to debt reduction. Grover was not happy with that, we did it anyway. And this is the point. The Bowles-Simpson Commission said raise whatever revenue you can and apply it to reducing rates. We did that in the Toomey plan by reducing the value of all this tax credits and deductions, the kind of thing you spoke of. And Toomey Plan scored by the Congressional Budget Office, would have reduced the top rate to 28 percent and every other rates by 15 percentage points. As a result of which, we could accomplish both goals. Senator Pat Toomey and other Republicans on the Joint Select Committee on Deficit Reduction ("Supercommittee") portray their new offer to raise close to $300 billion in revenues (under a plan to reduce deficits by about $1.5 trillion over ten years) as a significant concession, and some observers have suggested it represents a welcome first step toward a balanced deficit reduction plan to put the budget on a sustainable path. But a closer examination of the proposal raises grave concerns and indicates that, in fact, it adds little balance. It uses savings from closing tax loopholes and narrowing other tax expenditures mainly to set tax rates permanently at levels well below those of President Bush's tax cuts, and to make permanent both the highly preferential treatment of capital gains and dividend income under the Bush tax cuts and the temporary hollowing out of the estate tax for estates of the wealthiest one-quarter of 1 percent of Americans that Congress enacted in late 2010. Consequently, the proposal seems designed to make only a modest revenue contribution toward deficit reduction and then to take revenues off the table for the larger rounds of deficit reduction that must follow. Moreover, even while yielding modest savings, the revenue component would make the package less balanced by conferring large new tax cuts on the wealthiest Americans while forcing low- and middle-income Americans to bear most of the plan's budget cuts as well as its tax increases. CANDY CROWLEY (HOST): Well, and about 2 million of those will lose their benefits if long-term unemployment benefits are not extended. And there are lots of studies that show that one of the quickest ways to get money into the economy is through these unemployment benefits. So if I read you correctly, you would not be for extending those for another year but you would be for the payroll tax cut. 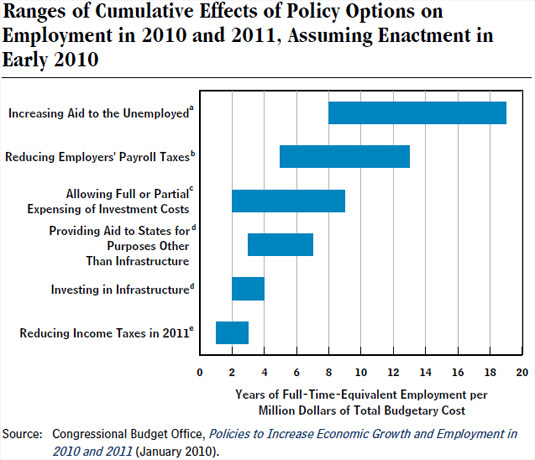 [...] Do you believe those unemployment benefits should be extended? CAIN: No. And here's why. Where do we stop, Candy, is the question? Here again, extending unemployment benefits, extending the cut in the payroll tax are just distractions from the bigger problem, which is lack of economic growth which has not been there. Secondly, we're spending money we do not have. It's unfortunate that people are unemployed. This is one of the reasons that I have proposed a bold plan to get this economy going which you know is 9-9-9. People need to go — want to go back to work. That's the good news. FACT: CBO Says Unemployment Benefits Are "Timely And Cost-Effective In Spurring Economic Activity And Employment"
Click here for much more about GOP rhetoric on jobless benefits.